Skype 8.0 for desktop brings Call recording, Read receipts, HD video calls, Mentions, Chat media gallery and more. 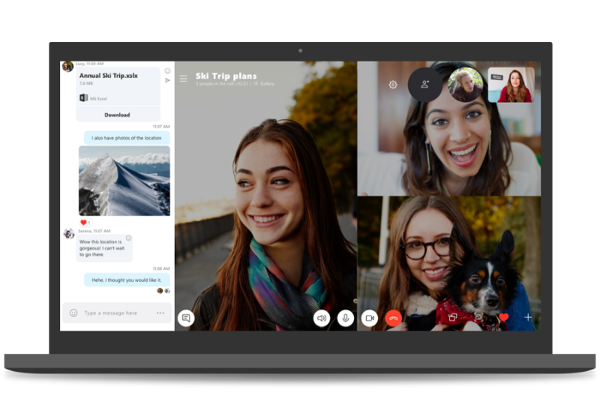 Today, Microsoft rolling out an updated version of Skype (8.0) for desktop that will replace Skype version 7.0 (also known as Skype classic). Microsoft encouraging everyone to upgrade now to avoid any inconvenience as only Skype version 8.0 will work after September 1, 2018. Free HD video and screensharing calls - Get together with 1 or 24 of your friends, families, or colleagues no matter what device they use Skype on. See everyone in high definition, view 1080px video, and share things together. Mentions - Use @mentions to easily grab someone's attention in a group chat. Simply type the @ symbol followed by their name to trigger a notification for them. You can easily find all your @mentions and get back to people in the notification center. Chat media gallery - Looking for the link or photo sent a few weeks ago? Chat media gallery makes it easy to find files, links, and photos that were shared in a conversation, whether it was yesterday or last month. No more scrolling through your chat history-just click Gallery under the chat name to see all the files, links, and photos in the conversation. Share photos, videos, and other files - Share up to 300 MB at a time over Skype just by dragging and dropping files into your conversation window. Call recording - Take call snapshots to the next level with call recording. Call recording is completely cloud-based, and as soon as you start recording, everyone in the call is notified that the call is being recorded-so there are no surprises. Call recordings combine everyone's video as well as any screens shared during the call. Read receipts - See at a glance who's read your messages. Once someone reads your message, their avatar appears beneath it in the Skype chat-enabling you to see how far someone has read in the conversation without tapping every message. This is especially useful in group conversations to help you make sure everyone is caught up with the latest messages. Private Conversations - Have end-to-end encrypted Skype audio calls and send text messages or files-such as images, audio, or videos-using the industry standard Signal Protocol. Messages and notifications in these conversations will be hidden in the chat list to keep the information you share private. Profile invites - Easily start a conversation or call with people who aren't on Skype yet. Simply go to your profile in Skype and tap the Share Profile option to invite friends to join you on Skype. Group links - Quickly get a group together on Skype, for either a group chat or call. Create a new group and tap the Invite More People option to share a link to your group. Anyone you send the link to can join your group quickly and simply. Skype version 8.0 rolling out on iPad - Features such as quoted messages, personalized themes, chat list, @mentions, and more are now available on the Skype for iPad.